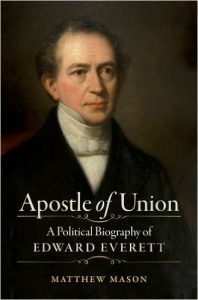 Apostle of Union by Matthew Mason, is a biography about Edward Everett. By sharing his life story, Mason reveals a sometimes overlooked part of Pre-Civil War history: the devotion many had preserving the Union and the Constitution. Everett is an example of one such champion to both causes. During his life, Everett was as minister; Massachusetts statesman; governor, orator; US Ambassador to the United Kingdom; and secretary of state to President Millard Fillmore. Until the 1860s, Everett strove to strike a balance between pro slavery and anti-slavery fractions wherever he was. In return for his efforts, abolitionists and pro-slavery fractions attacked him for not choosing a side. His feeling of frustration over these attacks poured out in the pages of his diary. 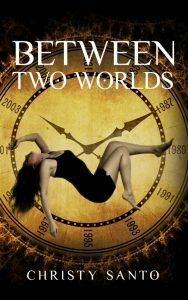 Years went by before Everett stopped compromising on slavery. Once he made this choice, it became easier to withstand personal attacks, when he pressed for slavery’s end. When not directly involved in politics, Everett toured the country as an orator. He spoke to large crowds about the Founders of the United States, especially George Washington, whom Everett revered and urged citizens not forget their national heritage even in times of trouble. Everett ‘s speeches changed as Civil War seemed more likely, he shared his fears for the nation to his audiences. When the war did break out, Everett got to work helping the nation through the war through his speeches, the newspaper articles he wrote, and in his letters to Lincoln, members of his administration as well as European leaders. Apostle of the Union, is a solid historical book, Mason by telling Edward Everett’s life story is able to show the multiple layers of the slavery issue and how it affected and molded one of our nation’s important politicians.